Really Reasonable Ribbon Blog: Ribbons and Flowers and Shakers, Oh My! Hello, Ribbon Lovers! 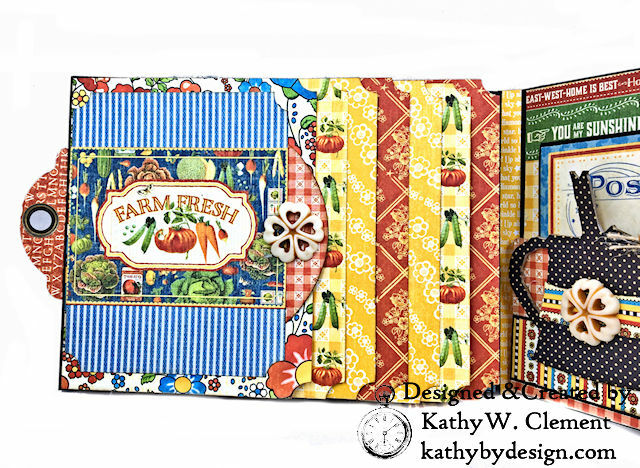 It's Kathy popping in today with a sweet little gardening themed folio. This one has ribbons and flowers and a shaker element, too! Oh, My! 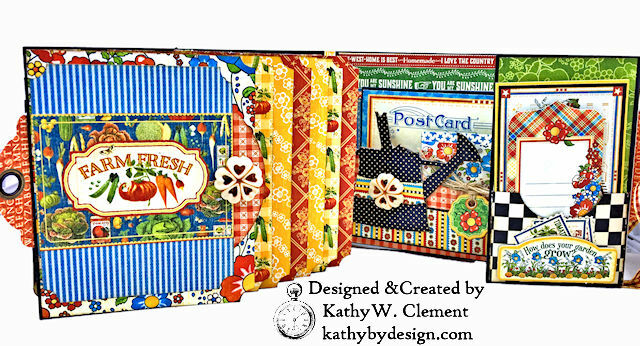 This is one of my fun card folio designs. The side fold folio measures 7" x 5" and it's filled to the brim with interactive elements. 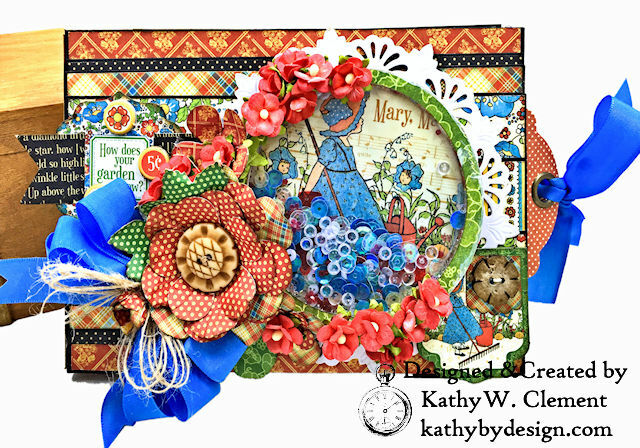 I love the way this Capri Blue Taffeta Ribbon pops against the primary colors in Graphic 45's Mother Goose Collection. I've used the taffeta ribbon in the bow cluster along with a little Natural Burlap String Bow. It also serves as the closure mechanism for the folio. The shaker element is surrounded by a combination of handmade flowers and Red Sweetheart Blossoms. 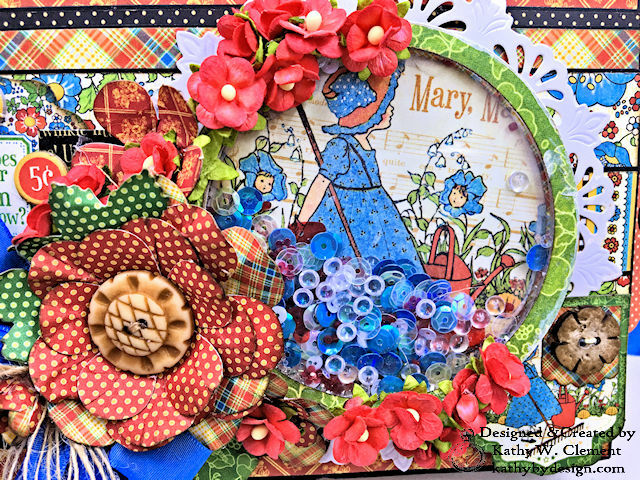 We are enjoying our tiny summer garden, and that inspired me to make this garden themed folio. I've combined papers from Mother Goose and Home Sweet Home on the album interior. I've included lots of flaps and pockets for loads of interactive fun. I even managed to fit in a waterfall feature so I can take photos of my proud hubby's heirloom tomatoes when they start coming in. To help you see how all these interactive mechanisms work, I've created a little YouTube video tour. Enjoy! I hope you are all enjoying a wonderful summer with plenty of time for family, gardening, travel, crafting or whatever pursuits help you to relax. Summer is gone too soon, so make the most of it and remember to capture those memories! 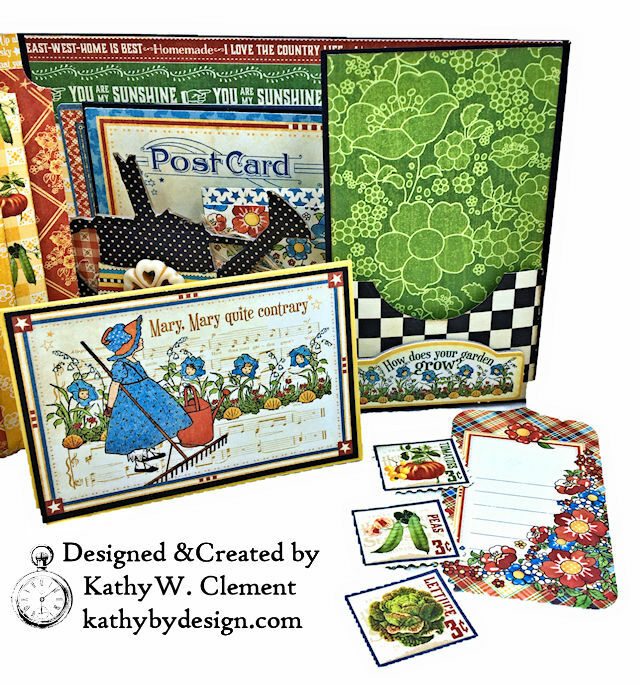 This Mother Goose card/folio is so stinkin' adorable!!! LOVE everything-blue taffeta ribbon, sweet heart blossoms, shaker pieces and the combo of these papers on the inside!! Really wonderful! go into your creations. AWEmazingly beautiful. I just joined the Ribbon Club where I will receive both July and August packs. I believe the blue ribbon used here is included in the July bundle. Can't wait to get it in the mail! I really like your use of the Staples tag as a closure feature. It looks very polished, and helps support front cover. Thanks Kathy! Jill in Salt Lake City,UT.